In 2001 Onondaga Audubon Society celebrated it’s 50th anniversary. To mark the occasion the chapter, through the extraordinary efforts of Dorothy Crumb, published a 60 plus page history of the organization. It is an interesting read as well as a lot of fun. The black and white line drawings of birds by Sue Adair, Cindy Page and Karen Allaban-Confer are a delight. A PDF of the book is available here. You can read it on-line or print it out, but be cautioned it is fairly large file. The following is from the May/June 1983 Kestrel newsletter. The then editor Cindy Page wrote it with recollections by Walter Spofford. I became curious about the beautiful rendering of the Kestrel logo when I took over as editor. I needed the original as the picture was small and had been copied and recopied. I did locate the original but my curiosity had been whetted so I wrote to former member Walter Spoffard (sic) in Arizona. He kindly supplied me with some background and other tidbits of our 32 year old club. 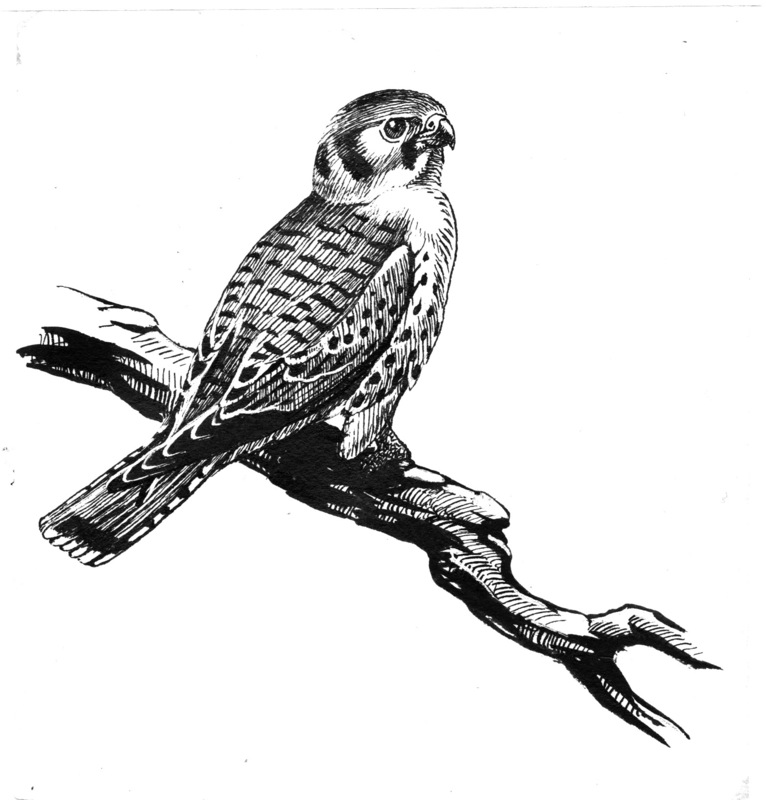 According to the August, 1963 issue of The Kestrel, OAS selected the kestrel as its mascot and H. Wayne Trimm, a former Syracusan and art editor for the New York State Conservationist magazine drew the sketch. “We are proud that our official emblem was designed by so distinguished a wildlife artist.” Also in that issue it was announced that “OAS finally had an OAS bumper sticker thanks to the efforts of Charles Farnham.” The sticker is 3 1/2” in diameter and is still available in 1983. According to Walter, “I came across a few references to OAS field trips. The first ‘official’ OAS field trip was on 29 April 1951 to Green Lakes State Park led by Wayne Trimm. 33 species were seen. I do not have the date of the organizational meeting in April 1951, but the group became a branch of the National Audubon Society at that time and adopted the name Onondaga Audubon Society . . . earlier, a group of us who ‘birded’ regularly including Bill Minor and Fritz Scheider and a few others had no real idea of forming a formal ‘Audubon’ society . . . and, taking a cue from my former society in Tennessee, the Tennessee Ornithology Society, I suggested simply ‘Onondaga Ornithologists’ but after the first real advertized meeting in April instead of our usual 5 people, no less than 55 or more showed up and voted therewith to become a branch of National. I did find a note that our first program meeting, 9 May 1951, was addressed by an old friend of mine and president of the Cleveland Audubon Society, David Swetland, who showed films of bird life in Florida. Editor’s note: spelling, punctuation and capitalization were not changed from the original. Please note the mis-spelling of Walter Spofford. The original artwork referred to in the above piece is now framed and hangs in the house at Derby Hill Bird Observatory. In 2011 as part of the Audubon in the Parks program the chapter led 6 field trips at Green Lakes State Park. That is a relationship with a 60 year history between Green Lakes State Park and Onondaga Audubon. The latest logotype representing Onondaga Audubon was created in late 2013 and first used publicly in February of 2014 on that year’s Derby Hill Bird Observatory Migration Report. It was created by Chris Andrews, a professional graphic designer, as a pro bono project. It is the identity you see on the page headers of this website. I’m not sure what site I should send my observation and ID of what I’m fairly sure are Northern Harriers.I live in Tully valley and for the last 2 weeks I’ve seen a pair attacking squirrels on the ground in front of my home.another single raptor attacking a squirrel behind my barn. I understand that they eat thier pray on the ground and not sure if they can fly w a squirrel in thier beaks. In the past I’ve seen many red tails but haven’t seen or IDed harriers.they are vary agile flying though timber, have hooked beaks and characteristic white lower body.one I noted had a very large white area extending towards its breast.thier wings are held up above horizontal similar to turkey vultures.which were also in the air one day. I suppose that I may have seen harriers flying other years and mistaking them for vultures.yesterday I spied a harrier on the fringes of tully village perched hunting over wet land.friday I saw one flying near the flood control dam on the Onondaga nation land. My questions are-1 have these birds always migrated in this area and-2 are their numbers greater than usual?i was told thier numbers are dwindling in NY. Thankyou would appreciate follow up to my questions !! Rick gillette.